Talk to me, Tivo: Jim and Pam are reunited when the Stamford and Scranton branches of the company are merged. Jam Cam: This is the episode we�ve all been waiting for and it broke our hearts. Sob. In Stamford, Jim tells Karen this move to Scranton will definitely be interesting. He follows that up with a plutonic high five and Karen watches him leave with a look of �I wish he was mine but he�s not.� Nice. Meanwhile, in Scranton, Toby tries to casually flirt with Pam by telling her he ran this morning. Dwight isn�t impressed so Pam tricks him into running around the building while timing him with a digital thermometer. Pam brings in food to the conference room for the new crew and mentions that she�s excited to see her old friend because it always makes people happy to see old friends again. Although considering she never referred to her �old friend� by name, I wonder who she�s talking about. And yeah! The Stamford people start to arrive. Who cares though? We�re all just waiting for Pam to see Jim again. Ugh. Wait. It�s Karen. Pam seems really nice in introducing herself and giving Karen a sympathetic look when Michael asks her if her dad was a G.I. Pam must not have seen last week�s episode when Karen said she was interested in Jim. Commercial break? Big Tuna, are you kidding me? And we’re back and so is Jim!!!!!! And Pam sees him! Get Martin out of the way, we don�t care about him. �Hi, I�m Jim,� he tells Pam as if she doesn�t already know. Pam runs over and throws her arms around him. He smiles over her shoulder. They�re back together! Finally! �The place looks really good,� says Jim, as he looks Pam up and down. Ah, it�s as if he�s never left. Squee! But where does Jim stand with Pam? Apparently, they�re friends. Blech. Nevermind. Not what we wanted to hear. It sounds like things have stayed the same. I mean, it looks like they�ve stayed the same for Jim and Dwight, but Jim and Pam is a whole different story. Ryan walks in and welcomes Jim back, then promptly drops his stuff at Jim�s old desk. Awkward. The good news is that Jim�s a nice guy and lets Ryan keep the desk. The bad news is that Jim has to now sit at a desk facing Karen with his back to Pam. He doesn�t look too thrilled about that and neither does Pam. I�m not either. Stupid Ryan. Jim goes to say hi to Toby and instead of hand shake, he gets one of those fist greeting things from Toby. Apparently, this is Toby�s way of trying to be cool so Pam will like him or something. Whatever. He also runs into Kelly, who gives him a big hug and is then offended when he acts like her life is separate from Katie Holmes and Tom Cruise having a baby. Ah, some things stay the same. Everyone heads into the conference room for a merger day presentation with Jim sitting down next to Pam at the table and then grabbing a stick of gum from Karen behind him. Pam gives Karen a one-over that looks a little vicious. Go Pam! The cute thing is we can see Karen�s gum in Jim�s mouth as it hangs open during Michael�s Lazy Scranton video. After the merger presentation, Karen sets up her new voice mail only to have Jim flirtingly tell her it�s bad and she needs to keep redoing it. Why is Jim doing that? Walk away, Jim! Walk away! As he walks away, Karen changes her message again. Ha! In your face, Jim. Jim is in the break room buying some bottled water when Pam comes in and asks where the grape soda is. Apparently, we�re dealing with Trendy New Jim to go along with Fancy New Beesly. In fact, she�s so Fancy New, she asks Jim to go out for coffee. Jim makes up some excuse about how he is still getting settled. Lame! Pam tries to recover by easily giving him that out and saying �Yea, whenever.� Then Michael walks in and we all cringe guessing at what�s about to happen. Michael seems to think there�s still a JamVibe � because there is � and tries to graciously leave the room in a very very obvious way. Awkward. Jim makes some stupid excuse about having to get back to work and leaves Pam hanging. In her talking head, Pam seems to be trying to reassure herself that today is going well so it�s all ok because today is good, in fact, it�s great. Yea, aside from the fact that Jim blew you off. Meanwhile, Karen insults Phyllis�s perfume from Bob Vance and Phyllis gives her a snide response. Ha! In your face, Filipelli! After another disastrous conference room meeting, somehow the air is deflated from the tires in the parking lot. Jim gets his coat on to check on the situation and walks out the door with Karen, leaving Pam behind at her desk. Pam gives Jim and Karen a bit of a bitter look before heading out herself. After checking their cars out, everyone heads back and in WHAT THE HELL? Karen rubs Jim�s back as she walks next to him. I saw that! And so did Pam! And she looks PISSED! For good reason too � that�s her man and we all know it. Back inside, Michael confirms that Jim is the new number two in the office as Jim leans against the wall, looking all hot and lanky. Well…you can�t blame Karen for wanting a piece of that, but she still needs to keep her hands off. With the day done, Jim gets in his car while answering his cell phone. It�s Karen. How convenient. Karen asks him if he wants to meet for a drink tonight. He says that sounds great. Jim, you told Pam you were busy and blew her off. Ugh! I�m not liking you right now. Jim notices in his rear view window that Pam is making her way to her car and he tells Karen he�ll call her back. Yeah! Go after Pam! Jim asks Pam if she thought things were weird today. Pam asks him what he means by that, which somehow elicits a response from Jim that he�s sort of seeing someone. WHAT? Ok, first, that was not the question Pam asked and second, Jim is not seeing Karen. He�s making it up to make Pam feel bad, which makes me want to throttle Jim. Pam tells him he can do whatever he wants to, which makes me want to throttle Pam. Besides, Pam confirms that they�re friends and always will be friends. NOOO! Why did you say that? Jim responds with a simple �Right,� that sounds like he�s a bit dejected. Well, maybe if you hadn�t turned down the coffee to go out with Karen, this wouldn�t be a problem, Jim. And then they get in their own cars and leave and they�re breaking my heart and I want to punch each of them and then go cry in the corner. This is not how the episode should end. The Others: Stamford employees walk into their new office in Scranton only to be greeted by �nifty gifty�s from Michael Scott, but the new employees immediately rub the Scrantonites the wrong way. Andy decided his competition is Dwight and goes after him with a vengeance, Ryan gets distracted by Hannah pumping her breasts in the open, and everyone gives Karen the skunk eye. Well, everyone except Jim who feels the need to flirt with her in the same office he shares with his one true love. Stupid Jim. What have we learned today, kids: Keep your eye on the prize. Don�t give up the fight even if you think the person you�re fighting for is dating someone else. Pam: Yes, I�m in a good mood today. I am excited to meet all the new people and to see my old friend again. That�s always something that makes people happy � to have an old friend back. Jim: Hi, I�m Jim. I�m new here. Pam: Oh my god. It�s really you! Pam: I know. I don�t care. Jim: Awesome! Good to be back. The place looks really good. Pam: It�s really good to see you. Jim: Where do I stand with Pam? No idea. I mean, we�re friends, always have been friends, um�that is where we stand. Pam: What happened to grape soda? Jim: Oh yea, I�m trying to move away from that, getting into more of a bottled water phase. Pam: You�ve changed so much. 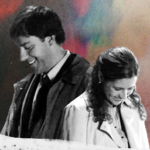 Jim: Well, I�m evolving, Pam. Pam: So when do I get to hear everything? Are you still getting unpacked or you want to grab a coffee or something after work? Jim: Oh um…tonight actually, no. I�m still getting settled. Michael [awkwardly]: O…K. Sorry to interrupt. [Michael leaves] Jim: I should probably get back to work…back to work. Pam: No, yea, me too. Jim: I thought you had already left. Pam: No, I just had some other stuff I had to do. What�s up? Jim: Oh nothing, I just feel bad, like things were a little weird today or something. Jim: I just think I should tell you that I sort of started seeing someone. Pam: Oh, that�s totally cool. You can do whatever you want. Pam: We�re friends. We�ll always be friends. Pam: Good to have you back. Jim: Yea, good to be back.